Thank you for choosing ProSmiles dentistry Melbourne for your implants treatment! Our team of experienced dentists will seek to facilitate all your needs in a cost-effective, comfortable and stress-free manner. This will allow you the peace of mind that you need when making this significant personal health decision. I’m considering dental implant dentistry, what are the stages in implant treatment? 1. The first stage is the placement of the implant. This involves a titanium fixture being placed into the jaw bone. 2. The second stage (the prosthodontic stage) commonly involves a porcelain tooth, usually infused with a precious metal substructure, being cemented or screwed into the dental implant fixture after a healing period of 3 to 6 months. Click here to go to single tooth implant, multiple teeth implants, All-on-4….case gallery. Other than cosmetic considerations, the loss of a tooth or multiple teeth affects your ability to chew properly, and can adversely alter your diet and nutritional intake. It can lead to unwanted teeth movement which further triggers a chain of negative consequences such as food pack areas, decay, gum disease and even jaw joint problems. When you lose a tooth, the lack of stimulation causes the bone of the jaw to shrink. This means that the loss of a tooth will eventually alter the shape of your face and make you look like you have aged prematurely. At ProSmiles in Melbourne, we understand the importance of having natural smile and functioning bite. 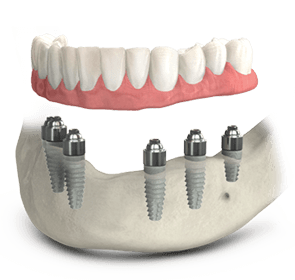 What are the advantages of using implants as a tooth replacement alternative? The fact that dental implants look, feel and function close to natural teeth means that you can feel at ease as these implants fit harmoniously into the dental arch and blend in with your other natural teeth. Dental implants are a permanent solution to missing teeth. Crowns bridges and dentures only alleviate the short term aesthetic issue of missing teeth, but they do nothing to alleviate the issue of bone loss. Most importantly our team will ensure that through quality implant dentistry you improve your smile without compromising healthy teeth. The procedure is performed mostly under local anaesthetic in our clinic. Your comfort and safety throughout the procedure is paramount. Please feel free to discuss any concerns you may have regarding the procedure with our team of experienced dental implant specialists. If you have concerns regarding pain or anxiety, rest assured that we offer sleep dentistry under the care of a specialist anaesthetist. If you have concerns regarding pain or anxiety, rest assured that we offer sleep dentistry under the care of a specialist anaesthetist or a dental sedationist. How much time is involved in the procedure and will I need to take much time off to recover? It may take as little 30 minutes or up to 2 hours to place the implants depending on the location and number of implants being placed. We also offer state-of-the-art guided implant placement and keyhole implant placement depending on your individual situation. The second phase involves the securing of the crown or bridge. The placement of the dental implant will be done with the utmost care and is a safe procedure performed under local anaesthetic, with many patients able to return to work and their normal routine the following day. Please view our gallery to see both the quality and care with which each treatment case is handled and how the final outcome can improve your own personal situation. What if the bone or gum tissue is not enough/insufficient for my implant? In case of insufficient bone or gum tissue, a graft might be the solution. Dr. Madhur Shiralkar will determine its necessity during your consultation. This procedure replaces missing bone with a material called a bone graft. This procedure not only replaces the missing bone but helps the body to regrow lost bone strengthening the grafted area by forming a bridge between the existing bone and the graft. Feel free to click here to find out more about bone and sinus grafting. Home care for your implants through regular brushing and flossing is essential. Regular dental visits are required for long term maintenance. If you have any general questions about Dental Implants, please contact ProSmiles Melbourne directly, we will be more than happy to respond to any question you have to give you the peace of mind you need. Choose ProSmiles Collingwood for premium quality dental implants and client service excellence. Call for your consultation on (03) 9417 6355.